Navigate 810 snaking kilometers of tropical shoreline and consistent tarmac following the best parts of Thailand’s coastal range. Swap the Gulf of Thailand’s sweeping sands for the clear blue waters of the Andaman Sea. Hang up your helmet after each day to relax in warm sand and admire the sunset. Refuel on some of the freshest seafood in the region. The ride warms up on the quiet countryside of the East Coast, heading for the beach town of Hua Hin and beyond. Highlights include stunning beach views and limestone peaks as we carve down and through Sam Roi Yot, Thailand’s first coastal National Park. Negotiate the rolling hills and steady climbs. Wrestle the twists and turns that mix up our cycling inland over the Isthmus of Kra to Thailand’s Western coastline and finally to the resort island of Phuket. Hit the road each morning to race through Thailand's lush greenery and past idyllic beaches. This well-paved ride is flat, fast, and exhilarating, punctuated by lush scenery and local flavor. A firm rider favorite; cyclists come for the challenge, and fall in love with the culture. As warm hospitality, like sunshine, is practically guaranteed in this “Land of Smiles.” Scenic and challenging, this trek encompasses it all. We transfer out of the chaos of Bangkok to the start of our ride in Petchaburi and are quickly in rural Thailand as we ride along the beach into Cha-am and on to the beach resort town of Hua Hin. Cycle from Hua Hin towards Sam Roi Yot National Park and ride below towering peaks of limestone then ride along the beach to Prachuap Khiri Khan and enjoy a seafood dinner. We leave the hotel and ride along the beach front road. We are now well away from the main tourist areas as we head towards a serene beach and our nature-friendly boutique resort. Rest day to relax at the beach. Our route sticks to the coast, giving us views of the sea to the left and rugged mountains on our right as we pass through Thailand's narrowest part to finish riding just north of Chumpon. Cross the Isthmus of Kra and head west on an undulating road that cuts through the lush jungle clad mountains to the spa town of Ranong where you can soak in the hotel's hot mineral spring pool. We ride through valleys today on an undulating road and pass many villages and children waving and yelling out farang, farang (foreigner). We continue our journey south, riding from valley to valley towards picturesque Khao Lak, through one of the worst areas devastated by the 2004 Tsunami. There are a couple of small hills to conquer before we leave Khao Lak, but then it's flat all the way down to Phang Nga and the tropical paradise of Phuket island. Today is yours to relax and rest after eight days of great riding! Day 1 - Petchaburi - Hua Hin Ride 68km. +194m / -194m. Another fabulous tour - my 6th SpiceRoads tour and 2nd time on this one. The riding was fairly easy apart from 2 longer days. Our guides & van driver backup were excellent. Food I think was the best we have had on SpiceRoads. All the support team go out of their way to make it a good experience. 10 in our group - when mishaps occurred, all was dealt with smoothly. SpiceRoads runs a first class operation. Our cycling guide Mr. Aum and support driver Mr. Rin are the best - super nice people and both are excellent at their jobs. The accommodations were outstanding and the lunches and dinners were exceptional - Mr. Aum did a great job selecting traditional/local Thai dishes, many unique to the regions we were cycling in. We were very happy with our rented bikes. A memorable trip with a great company. If you're considering Bangkok to Phuket, I highly recommend doing it with SpiceRoads. Excellent work from Aum, our guide and Mr. Rin, our support driver. Good distances each day, great food and local snacks and accommodation standards beyond expectations. This tour is 100% on road, and we designed the route with road bikers in mind. If you are looking for a more leisurely ride with more stops at sites, then please consider our Cycling Coastal Thailand tour that is along the same route. We start with a transfer out of Bangkok to avoid the dangers of riding through a very busy metropolis. The first half of the ride is on flat roads, mainly following the beach. The total distance is 789 km in eight riding days. Some of the distances are quite long, but the roads are smooth, making it an achievable distance on a road bike. The trip is fully supported, and your guide’s expert knowledge of the area and terrain means that you always know what is coming up in terms of distance and difficulty. This makes a tremendous difference, as does the constant supply of cold drinks, ice, and fresh fruit. Suitability: Fitness, of course, will be a huge asset on those long days and on the undulating hills. The tour is fully supported, and the bus is always close at hand for those that find the riding too difficult. Biking Conditions: The roads are 100% tarmac and in good condition. There are some hills, mostly rolling with the exception of the steep but short hills in Phuket. We meet at a Bangkok hotel before we transfer to the start of our ride in Petchaburi (approximately 2 hours). This ride is a gentle start to the trip as we head out of Petchaburi and into rural Thailand, along roads flanked by paddy fields and palm trees. We then ride along the beach into Cha-am and on to the beach resort town of Hua Hin. The town is closely tied to Thai royalty. The last 20 km is on a main road, but there is a wide shoulder to ride. If the traffic proves to be too heavy, this section can be transferred. We top off our day with a seafood dinner on a pier in the centre of town. We head out of Hua Hin, part of the way taking advantage of a new cycle lane, towards Sam Roi Yot (300 hundred peaks) National Park. This park has spectacular limestone formations and freshwater marshes in between the peaks. We ride on quiet backroads along beaches with striking limestone peaks as our background. After the park, we have a short ride on the main road, about 20 km, before heading back to the coast, passing many small villages. 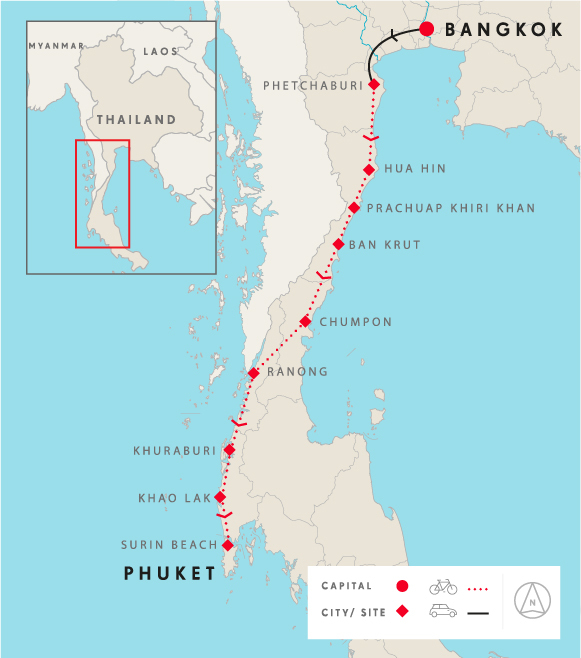 The final section is along the beach to Prachuap Khiri Khan. The selected hotel has some great views and, as the town is well known for having some the finest seafood in Thailand, we’ll feast on the local specialties at dinner. We leave the hotel and ride along the beachfront road for about 12 km before hitting the main road. This section is 9 km. We are now well away from the main tourist areas, and the roads are quiet and in good condition. We head towards a serene beach and our nature-friendly boutique resort. Time to relax in a hammock and listen to the surf. This is a rest day – you’ve earned it. Spend it relaxing at the beach, wandering around the fishing village of Ban Krut, or taking a dip in one of the two salt water pools at the resort. With legs rested, it’s time to do some serious kilometres. We ride 112 km on quiet side roads with very little traffic. Our route sticks to the coast, giving us views of the sea to the left and rugged mountains on our right. We are passing through Thailand’s narrowest part as the border with Burma is less than 20 km away at some points. We end the ride just north of Chumpon, at another secluded and quiet beach. We cross the Isthmus of Kra, which separates the Gulf of Thailand from the Adaman Sea, and is just 44 km wide at its narrowest point. We head west for about 60 km on an undulating road that cuts through the lush jungle-clad mountains that surround this area. The hills and the twists and turns in the road make for some varied riding. As there are few roads through the mountains we spend most of the day on the main road, however there is a wide shoulder. There is a climb of about 3 km starting at the Pun Ya Ban Waterfall, and then it is downhill and flat all the way to the town of Ranong. This is a spa, fishing and border town, which makes for an interesting vibe. We ride through valleys today, so the road will be rolling, but there are no extreme climbs, just enough ascents and descents to make the ride interesting. We pass many villages and children waving and yelling out farang, farang (foreigner). After some great views, the ride ends in a lovely little resort nestled in a valley and surrounded by lush tropical rain forest. We continue our journey south, riding from valley to valley towards picturesque Khao Lak. We have little choice but to take the main road for half of today's cycle. The road flattens out a bit as we reach Takua Pa, a former Portuguese settlement. The region was an important tin-dredging centre in the first half of the 20th century, but there remains little evidence of the mining as rubber plantations have covered the dredged land. We next ride through one of the areas devastated by the 2004 Tsunami. You’ll be amazed to see how quickly this area has bounced back and been rebuilt. We arrive early to the hotel, so you can spend time in the amazing pool this afternoon. The last leg of the tour is to the tropical paradise of Phuket, the largest island, as well as a province of Thailand. There are a couple of small hills to conquer before we leave Khao Lak, but then it’s flat all the way down to Phang Nga and Phuket. This road is in excellent condition, and you’ll make good time towards our resort on Nai Yang Beach. Phuket is connected by a bridge to the mainland, and we’ll stop for a celebratory picture before riding on to our hotel. Today is yours to relax and rest after eight days of great riding. We can help with arrangements if you’d like to extend your stay at Phuket or organise transfers to the airport for onward flights. Because some people can't imagine going on a trip without their own beloved bicycle, we do not provide them as part of this tour. However, you can hire bikes locally for the price listed in the tour pricing section. The bikes are Trek 2.1 C, Domane 2.0 and carbon Émonda S5 road bikes, with Shimano components and seat posts. If you have your own saddle that you are comfortable with, you are welcome to bring it, and we'll fit it. We can provide strap-style toe cages if requested, but you might like to consider bringing SPD clip pedals if you use them, and please make sure to bring your shoes and cleats. If you bring your own bike, please make sure it is a road bike in good mechanical order.